So as we’ve seen, the master plan of God involves creating a unique beings (humans) with His nature, in His likeness to join His immediate family. He created the physical world that we called earth and placed these humans in it; the plan is to join the spiritual world where He dwells with the physical world together as one so that He could be united with them to rule and govern the universe together as a family. That’s right, we were created and chosen as the ARISTOCRACY of God’s Kingdom. AMAZING!!. This is God’s dream. [And you thought you were the only one with a dream:-)]. I say dream because this plan will NOT come to pass unless we, humans voluntarily give ourselves to it. OK, before you go on thinking it’s all up to us, just hold on a second and comprehend that we are talking about God here…if it’ll help go back to “Week 2 Day 2: What’s God Like?” to grasp the truth that God does not need us for anything. We know He became the 1st born son of God through in which humans will be shaped into His exact image. Not only that we’ll do exactly what He does. Meaning He’ll share His position with us. Why? Cos that’s what husbands do. As His bride, He cherishes and loves us more than Himself. In ancients times when Kings are very pleased with their wifes, they will usually promise to give them anything they desire up to half of their Kingdom. But not Jesus; He’s promised to share with us ALL of His Kingdom. So what does Jesus do in heaven? Probably a lot more than we could ever know but two prominent titles given to Jesus after His resurrection is that of a Priest & King. He’s the High Priest & King of Kings. As a priest He intercedes for us (Rom 8:34, Heb 8:1) and as a King He reigns over a people (Kingdom), everything in fact (1 Pet 3:22; Eph 1:10). Interestingly that’s the same title given to us, the redeem humans (1 Pet 2:9, Rev 1:6; 5:10). Our ultimate calling is that of priests and kings just like Jesus. 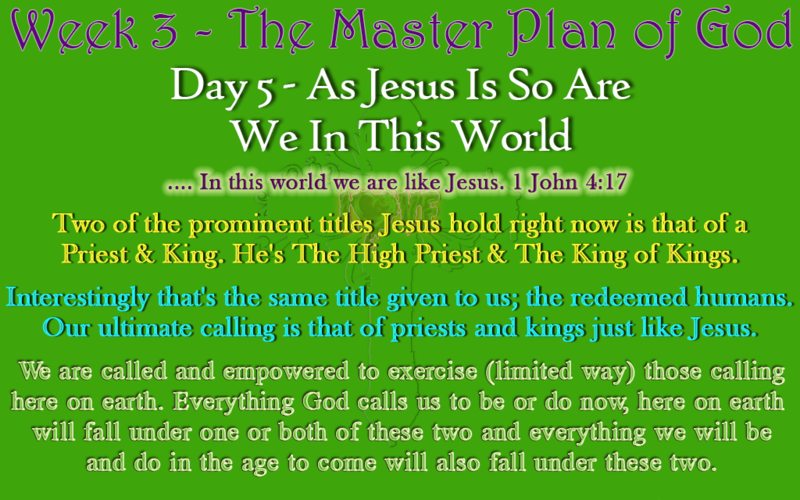 As high-priest; Jesus is a priest over many priests and as King of Kings; He’s a King over many Kings. Of course we do not and will not function fully in that calling YET. Simply because He has not brought the fullness of His Kingdom here on earth. However, we are called and empowered to exercise (limited way) those calling here on earth. The desire you have to be significant, to lead (overseer), to serve, to build, to make things better for the benefits of many are all traits of your Kingly calling. The desire to serve others, to praise and worship, to intercede for people and nations; to bring understandings of things (of God) to others are all traits of your priestly calling. Everything God calls us to be or do now, here on earth will fall under one or both of these two and everything we will be and do in the age to come will also fall under these two. DON’T DESPISE THE SMALL & INSIGNIFICANT THINGS YOU DO HERE ON EARTH COS THEY WILL COUNT FOR ETERNITY.